I have a friend who is at Bandon this week. 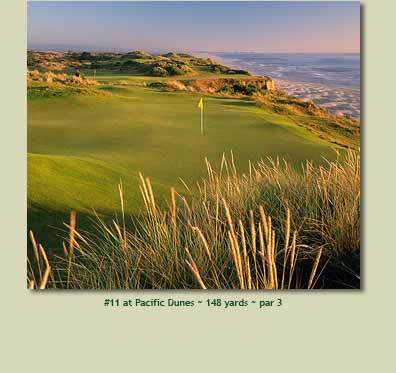 He says that it is the real deal - a true windy�Links golf course. It looks darn pleasant, and almost makes me wish I played golf. But I already have more than enough hobbies and chores. If you "already have more than enough hobbies and chores" then you should seriously consider taking up golf. Your life is way too complicated. To a "golfer" the game is a self examination. You play against yourself. You are the judge. Those dilettantes who blame a bad lie or weather or the greenskeeper or the phase of the moon are rightfully disdained as just not getting it. Throughout a golfer's life, from duffer to accomplished, you live for the very few shots each round that bring oohs and ahs - from yourself. After a while you realize that, in the words of Bobby Jones, "golf is a game played in the five inch space between the ears". Mr. Eldrick Woods, known to a few close friends as "Tiger", has said that he hits maybe two perfect shots in a tournament. Golf is a gentleman's game. Etiquette is the essence of golf. The very first entry in the Rules of Golf is devoted to etiquette. We see a number of times each year where professional golfers call penalties on themselves. Infractions that nobody else sees. Maybe $50,000 penalties. Amateur cheaters are lonely. Golf is a window into a man's character. Everybody, even the first time player, occasionally makes a stroke that's just as good as the professional. Nature of the game. How does a man handle a bad stroke? Window. Responsibility or excuse? I usually go to a golf course by myself and "hook up" with other players. I have played with probably more than two thousand people over the years. Four plus hours with total strangers. Gaspoles in any crowd but, on balance, a cut above the crowd. That is a lovely comment - an essay in itself. Thank you. I played the Links at Crowbush Cove a few years ago - what an incredible golf experience. PEI is well worth visiting and not too far for New Englanders.